Tiramisu probably has to be my hands down favorite dessert... like maybe, ever. If I could be "cursed" with only being able to enjoy just one dessert for the rest of my life, it would be tiramisu. This past summer I attended my father's very Italian family's reunion & wanted to bring a sweet treat that they all would appreciate. But I also wanted it to be potluck friendly and portable. If you have ever enjoyed traditional tiramisu, you already know that it is indeed not very portable and requires at least two hands to consume. These Tiramisu Blondies are the perfect solution! No utensils required to enjoy this one, folks. ;) And they are already cut and ready to go, so no one has to fumble with a serving spoon or knife. These blondies definitely earned the title of Popular Tiramisu Blondies- every single one of them was gone before everyone had even finished their dinner plates! Surprise! 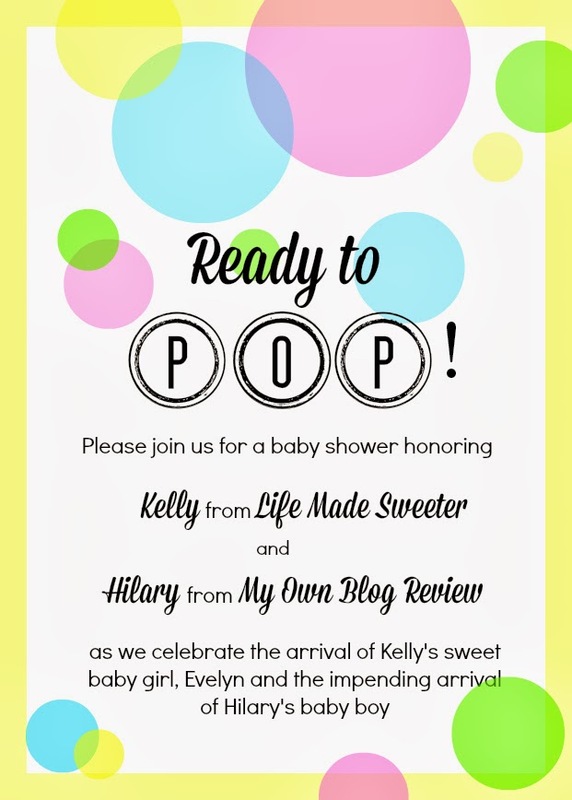 Today we are inviting you ALL to a virtual baby shower honoring Kelly from Life Made Sweeter and Hilary from My Own Blog Review. 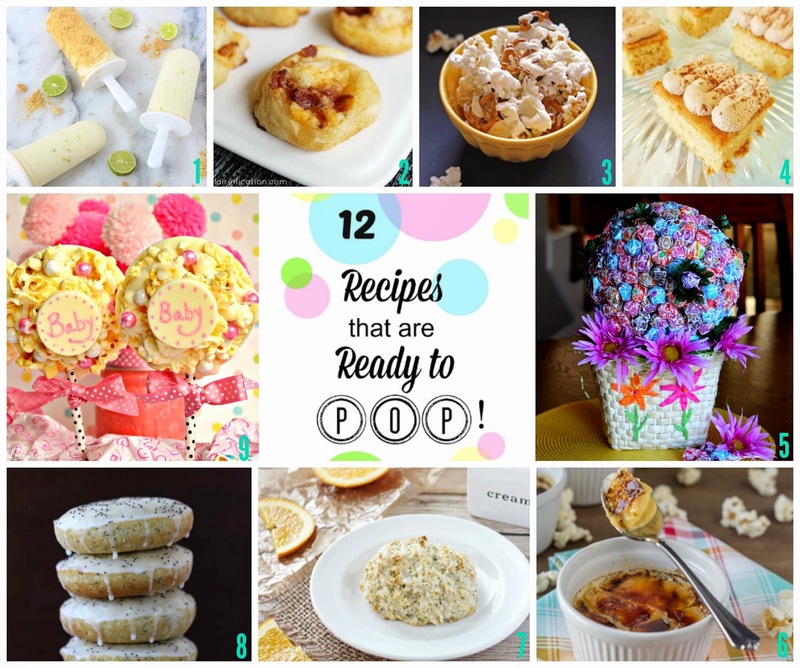 To celebrate, we are sharing 11 recipes and crafts that are ready to "pop". Make sure to "pop" over and check out everyone's posts below. Congratulations Kelly and Hilary! Preheat your oven to 350 degrees. Spray the inside of a 13x9 pan with cooking spray. Set aside. In a large mixing bowl, combine the cake mix, egg, coffee, coffee liqueur, & melted butter. Mix well or beat on medium speed for a few minutes. Pour the batter into the prepared baking pan. Bake at 350 for 20-25 minutes, or until the edges are golden brown and the middle is set. Once the blondies have cooled, prepare the frosting. In a medium mixing bowl, cream together the butter and cream cheese until light in color and creamy. Add in the coffee, coffee liqueur, & vanilla and beat on low speed. Add in the cocoa powder & mix again. Slowly beat in the powdered sugar one cup at a time. Beat until fluffy and creamy. Frost your blondies as you desire. You could simply frost the entire pan and then cut into squares. 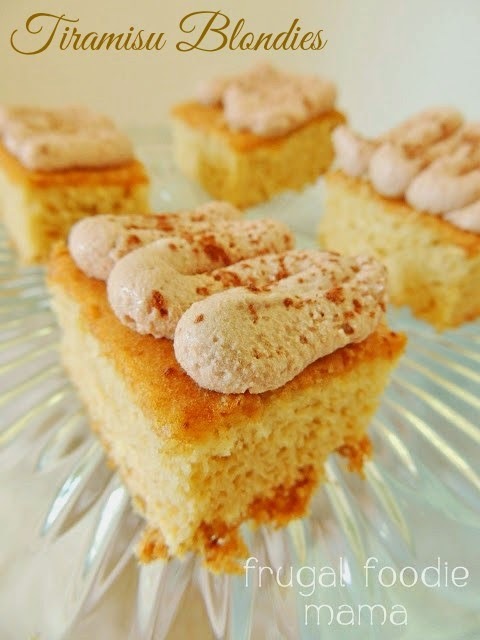 Or if you want fancier blondies, cut the individual blondies & then prettily pipe the frosting onto each one as I did with mine. Dust the frosted blondies with cocoa powder, if desired. Bring these Tiramisu Blondies to your next get-together and everyone will be raving. You can easily leave out the coffee flavored liqueur if you will be serving children or say pregnant gals. ;) And sub out the strongly brewed coffee for decaf if you want to avoid the caffeine jolt. You could also use mascarpone cheese for the cream cheese if you would like to go for a more traditional tiramisu flavor. I used the cream cheese instead to make this dish a little more budget friendly. Mascarpone cheese easily costs upwards of $5 for an 8 ounce container where I shop! 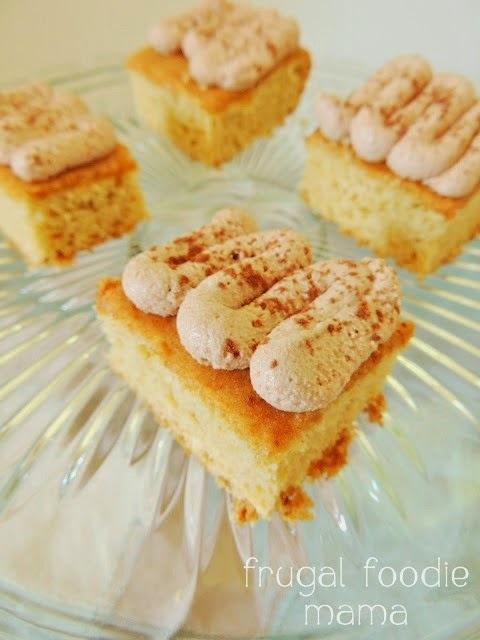 What upcoming gathering or party will you be baking up these Popular Tiramisu Blondies for? Be sure to check out all of the other dishes everyone brought to Kelly's & Hilary's virtual baby shower! Lemon Cheesecake Pops - What's Cooking Love?